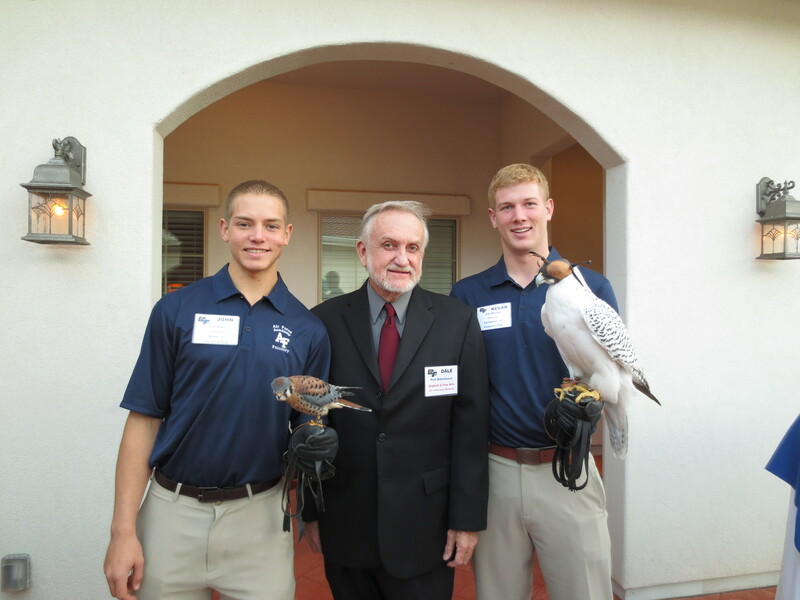 Dale at the US Air Force Academy in 2012 with the Academy falcons and their handlers. I first contacted Dale Ritterbusch, a Wisconsin poet, last year when I was seeking permission to include his poem in one of our poetry cards and braille booklets. Dale asked me if I had an additional card of his poem in braille. Well, I thought, that’s doable but the braille poetry booklets are usually 16-18 pages and unless Dale knew a braille reader he wouldn’t be able to pick out his poem. So I emailed a local friend Julie Woods, to see if she would mind transcribing Dale’s poem onto a single card which I could send to him. And as all things with Julie, aka that blind woman, no sooner said than done. At that stage we were still contracting the RNZFB to transcribe each card but after distributing 190 braille poetry booklets we’ve had to abandon this part of our project, due to lack of funds. May update – thanks to the Lion Foundation we’re back in business with the Braille poetry booklets!!!! As Dale is currently in Colorado Springs his wife Patricia has been answering all my queries. She initially sent me one poem so an email flew straight back requesting more please!! Dale Ritterbusch is the author of two collections of poetry, Lessons Learned (1995) and Far From the Temple of Heaven (2005). He is a Professor of Languages and Literatures at the University of Wisconsin-Whitewater where he teaches creative writing and literature. He has served and is currently serving (until May) as the Distinguished Visiting Professor in the Department of English & Fine Arts at the United States Air Force Academy, 2004-05 & 2012-13. The more years I spend writing poetry the less I have to say about it—what it is, what it does, how it should impact the reader. Any definition of poetry falls short, revealing comic ineptitude like chasing a greased pig at the county fair—you almost grab it and then it squirts away. So I know that most poems are not, that a poet is lucky to write a few pieces that deserve that appellation, and that few pieces will endure. That is the mystery, the reason for writing, nothing more, nothing less, exactly as it should be. and the saucer, too, stops short. the snow heavy and deep. and dream of a faster ride. like the cold melting down my back. “It doesn’t make sense,” she says. know anything. So I explain, “It’s just arbitrary. for a framus so I quit while I’m ahead. whatever equals a full measure of everything. of the world? Again I’m stumped. and tickle her knees until bedtime. to pinch a few spears for dinner. always running behind your mother’s skirt. had to run across the flower bed to chase it down. into my chest, sometimes close to my face. Momma’s boy as the sky reddened like a welt. of the war as we could. digging it up before morning.